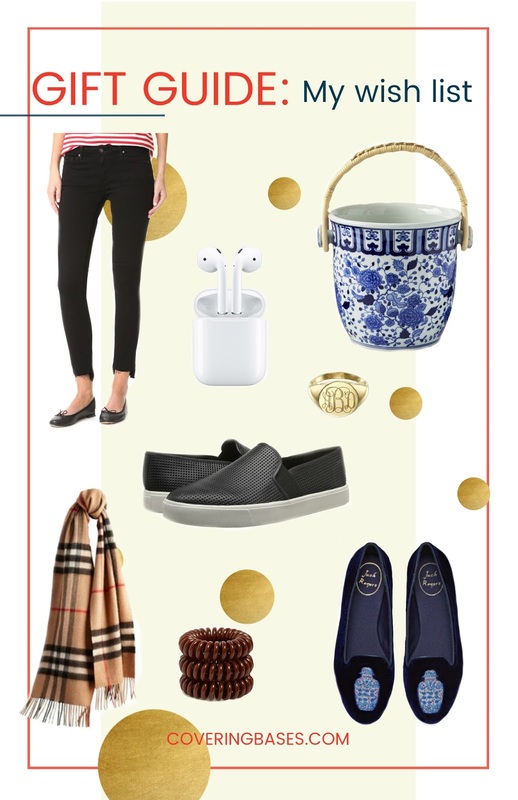 The gift guide season is upon us and I thought there was no better way to start than to kick it off with my Christmas list! I admittedly am the hardest person to shop for but hopefully those who love me will see this and get some good ideas. AG Jeans: I actually already have these jeans and love them -- wear them to work all the time -- but I accidentally fell (see the aftermath HERE) and ripped an ugly hole in the knee. I want to replace them and am hoping Santa will be my guy to do so! Air Pods: The Beats wireless headphones have been on my radar for a while but just recently (by good marketing) I've decided that I instead want the air pods. I feel like they'll just connect and work better with my apple products and I like that they are totally wireless. Champagne Bucket: This has been on my wishlist FOREVER but it's been sold out almost all year. So happy it's finally back in stock and *hopefully* someone will get it for me before it sells out again. I mean whats a Krista wish list without a little blue and white. Monogram Signet Ring: This is actually what I'm asking for from Andrew. I really love my signet ring (can purchase HERE) but I want one for my pinky finger -- which happens to be a size 3. So it's nearly impossible to find a place that will monogram the way I want AND have my size. Andrew has been tasked to find the perfect ring! Burberry Scarf: This scarf was a recent addition to my wish list -- this fall I saw so many people totally ROCK this scarf. So much so that now I want it but the price is steep for a scarf. This might be one I snag for myself. Vince Sneakers: Ok so I have a pair of these already in grey and I literally wear them 4 times a week. They are the most comfortable shoe I own (after you break them in) and I have actually worn them so much they have become so gross on the inside and are just too worn down. I'm going to get a little crazy and ask for them in black and see how they go with my winter wardrobe. Wish me luck! Invisibobble Hair Tie: My girlfriends at work got me hooked on these hair ties and now I won't use anything else. They are surprisingly great for holding your hair tight (without feeling tight) and for not creasing them as bad as regular hair ties! Plus they won't damage your hair which is a big plus. Ginger Jar Loafers: A reader on Instagram sent me these and now I'm convinced my life isn't complete without them. I mean they are blue velvet loafers with ginger jars on them... have you ever seen anything more perfect? ?